IP address can be applied in many cases, especially when you know how to change IP address, but a seldom known application is its use for router login, in which case the IP address is used as a URL to access the login page of a router. The magic IP address is 192.168.1.1 which serves as the default IP address of most routers. In this article, you will learn everything a beginner needs to know about 192.168.1.1. Setting up a new router or configuring a connected network requires that you know its IP address. With its IP address, you can be able to access your router to view and even change settings. Where do you find the router’s IP address? Well, check at the backside of the router or at on the box of the router. And the default IP address is 192.168.1.1. For an old device, it could be modified, but users can easily change it back to default by pressing the Reset button on the router for a dozen of seconds. Another important password that should draw your attention is your Wi-Fi password. WPA2 and PSK is the most secure option while setting password for your Wi-Fi after login. To make the Wi-Fi safer, apply a strong password, which should be a combination of letters (both upper case and lower case), numbers and special characters. Do not use your name or your family member’s name as a password. Try a unique combination, which is obvious to only your family members. Note: Always pay attention to network security, especially when connecting to a Wi-Fi. Otherwise, you may end up with losing both money and precious data, in which case you will definitely need Jihosoft File Recovery Software to get back your important photos, videos and document files. To be able to secure the router, you will need to change the default username and password. Using the default username and password may risk your router being hacked by unwanted users, which may even lock you out of your own router. So, changing the default login credentials can help stop people from using your router without permission. It is the easiest way to secure your router and network. But then again, the owner of the router can always reset the router to default settings. To set up internet connection on your router, you will need to use the information provided by your Internet Service Provider. For example, if you want to setup internet for a dial up connection, use username and password in the router for dial-up. For quick internet connection setup, it is advisable that you use the Wizard tool. If you want to make sure that your Wi-Fi is secure, the first thing that you need to do is change the SSID network name to something else. Give a unique name to your Wi-Fi so people may not be able to identify the network whenever you are using your router. If your router supports the feature that enables people to hide SSID network name, you can go ahead and activate the setting. Hiding the SSID network name will make your Wi-Fi more secure as it won’t be visible to anyone except you. To change your router’s password, you will need to access the router’s admin page. Go to advanced settings > Router Admin > Change Password > Enter Old and New Password and save. The exact steps may vary on routers made by different manufacturers, but there usually has a similar clue on the management page. In the worst case, you can reset the router and setup again with new password, just like you can even reset Windows computer password. Most Routers have the same default IP address – 192.168.1.1, but the following brief instructions can guide your login to popular routers step by step. Connect your Cisco Router to PC using RJ45 cable. Turn on Router and PC. Open Browser and type 192.168.1.1 and press Enter. Enter Default username and password (admin-admin) if you haven’t changed it. Or Enter your username and password. This will open the Cisco Router Admin Page. Now you can customize all your settings and also change WiFi password. Plug D-Link router with your laptop or desktop with Ethernet cable. Open Web browser. Type http://192.168.1.1 or http://dlinkrouter > Enter. Log in to the D-Link router with the username and password. If you are a login in for the first time, click on Setup and then go to wireless settings. You can setup it manually or automatically. Connect Netgear router with your Windows PC and then open Browser and type 192.168.1.1 > Enter. Enter the Router’s default username and password. If you don’t know default username and password then check the manual that comes with the router. Or simply contact the manufacturer. Go to Wireless Settings and customize settings. TP-LINK Router has an IP address 192.168.1.1. Connect Router and PC with the RJ45 cable. Type 192.168.1.1 in browser > Enter. IP address is configured improperly. Incorrect IP address is used in the browser or wrong settings set up. The router is not reset after a failed setup process. The wrong proxy is installed in the browser. Now reconfigure the proxy properly. The wrong or faulty formed IP address is used like 192.168.I.I instead of 192.168.1.1. You can also read the manual or contact the manufacturer for help. Connect one of the routers with PC using LAN cable and then go to 192.168.0.1 or 192.168.1.1 from the browser. Go to Network or LAN Setup and change the IP address to 192.168.2.1 and save. Now, connect both the routers with LAN cable and they will work just fine. Usually, new routers have auto setup mode. They allow users to configure it but if the user doesn’t want to Setup a new Router then they automatically setup it for the user. They find default router login IP address and password for you. 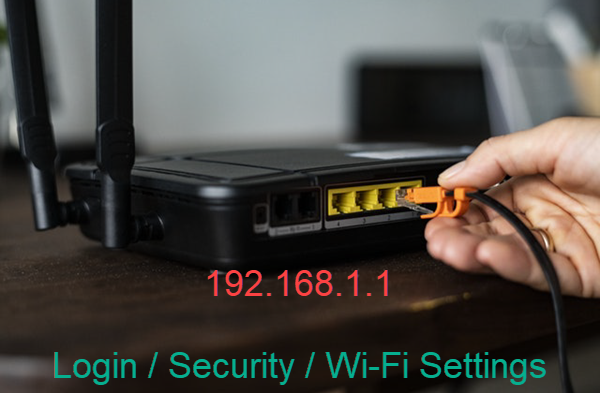 In this tutorial, we have learnt the basics of 192.168.1.1 and by now, we believe that you are able to login to your router’s admin page to set up and secure your router and the Wi-Fi network. We hope that this guide helps you solve some primary problems related to IP address 192.168.1.1. If you still face any challenges, you can contact the router’s manufacturer, or drop a line below for help.